Size and scale, texture and surface decoration, piercing and appliqué will all be explored as you create a pierced triangular pendant with an unusual hinge in this intensive new class. You'll design, then engineer a 3-sided vessel whose piercings allow light to pass through and whose walls feature a "live" edge. Celie will also teach a new simple and elegant hinge design. The class will include a section comparing alternative hinges and variations on the catch design. Decorative solutions for the bail and for the chain will also be discussed. 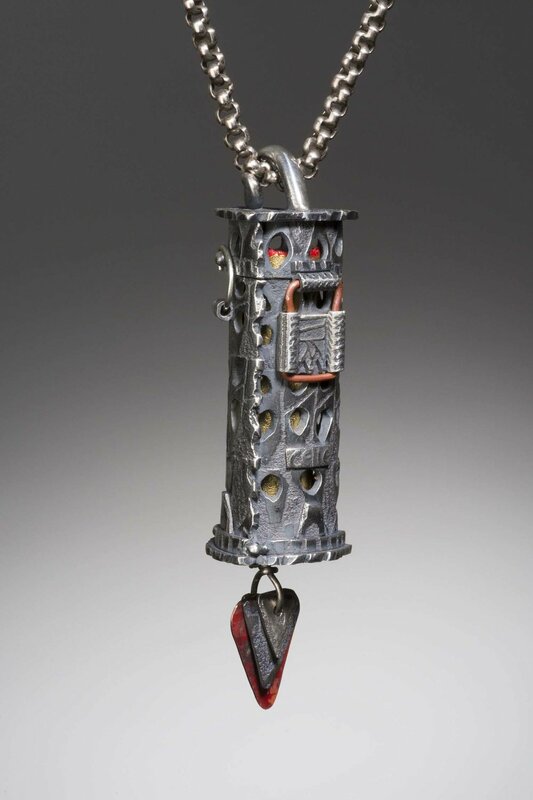 All aspects of engineering this dynamic pendant will be addressed; from the weight of the piece, the type of chain it hangs on, to the closure; whether or not to patina, and what metals to use for various details. The pierced walls of this vessel allow for light to move through it, or hold a treasure, like a gilded scroll casting light mysteriously through its interior. You’ll start with a short instruction in etching on polymer (tear away technique) to make your own texturing tools for metal clay. Then you’ll learn the basics of working with PMC OneFire Sterling. PMC OneFire Sterling is ideal for making hinges; it offers greater strength, durability, and more surface hardness than the fine silver metal clays and it fires in air. (No carbon!) Its longer working time makes it a pleasure to use. Although all hinges require some degree of precision, the type taught in this class allows for a more relaxed approach to the engineering challenges involved in a hinge. In addition, you’ll learn techniques for visualizing a design, mapping it out with paper, making simple templates, and organizing the work into manageable segments. Firing will be thoroughly demonstrated. The class cost is $525. The Material Fee is $115. The materials fee includes Celie’s PMC tear-away textures, misc. polymer and paper for projects, gold leaf, tools and supplies specific to the projects, including specialized mandrels, liquid polymer, acrylic, sanding and finishing supplies, fine silver wire, Argentium wire, sterling chain, brass and copper wire and sheet, use of various other supplies and consumables, Celie's demo materials (PMC, polymer, precious metals) and handouts. Also included are many tools and supplies for you to use including a glass work surface, glass palettes, and a desk lamp. Each student will be given a couple of sheets of Teflon paper, and water and oil for working with PMC. PMC: I suggest you budget 2-3 packs (but the amount of clay you use is up to you) of PMC OneFire Sterling 25 gram packs. Basic supplies will be available to purchase individually during the class. A list of local lodging choices will be sent upon registration. A supply list will be sent in the beginning May. The class will be capped at 9 people. TO REGISTER: E-mail me first to make sure there is a spot in the class. (If you've already emailed me, your spot is secure.) Then send a check for $640 by April 1st. After May 1st this is non-refundable, unless a replacement can be found, in which case your refund would be the tuition minus a $50 registration fee. Please e-mail me if you would like to split the tuition into two payments.